Don’t Run Away From The SOMMELIER!! Now that I am back to being a SOMM (Cool Geeky Slang Word For Sommelier or Wine Person) in a Restaurant Arena, I thought I should write a blog entry to help calm my reader’s nerves! As I approach a table in my suit and tie while guests browse through hundreds of pictures on a fancy high tech I Pad listing all of our wines, I can see the look of pure FEAR in their eyes similar to when approached by a Jehovah Witness, an Insurance Salesperson or a Used Car Salesperson. I am hear to honestly bluntly tell you, us SOMMS (Love using that word) pretty much get paid a Salary plus some sort of extra payment calculated by the wine sales or the per bottle sales so unlike the other categories of people you are petrified of, we all pretty much earn a living whether you order your favorite Pinot Grigio Or Cabernet Sauvignon whether it is $40 per bottle or $400 per bottle or not our recommendation, we still get a paycheck. I do feel however my SOMM Brothers and Sisters working in the field do this type of work out of a Passion for Helping People Discover a new Wine or Guiding them to help you find a Selection within Your BUDGET, YOUR PALATE, and create not just another dinner but a Dining Experience you will never forget. I urge you to give the Sommelier, in any Restaurant that is fortunate enough to offer that service, a chance. You can always not take their recommendation and go with the old standby you have been drinking over and over again or you just might find out like the following examples from my experiences, that you could literally wind up trying a wine that was less money than you wanted to spend and changed your entire life with just a little guidance from a person who again does this for Passion not Commission. Pinot Noirs and Merlots are so popular. The restaurant I work at serves very rich meats with very rich flavors. Most Pinot Noirs and Merlots disappear in your mouth and don’t pair up very well with this kind of heavy meats. Still most people look for the familiar and don’t realize as I have said in other Blog Entries that there are wines for every purpose. Some wines for just drinking and chilling out or some wines for when you are about to ingest 10 pounds of Beef, Pork, Lamb, Ribs etc. If you were in a $35.OO per bottle budget and you were looking for a Pinot Noir Or Merlot, you would probably gravitate towards the brands of those wines you know. The SOMM like myself could guide you into an Old Vines Garnacha from Spain that you would have not even looked at on the Wine List. 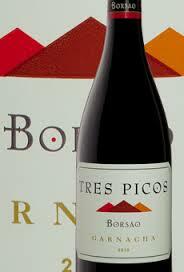 Borsao Tres Picos is a great one to try and I have changed people’s dining experience full circle with a $38.OO bottle that is dark and full bodied in the glass. Aromas of Black Fruits, Smokey Meat, Cedar, Vanilla, Black Pepper and a palate full of Rich, Lush Complex Wine that stands up to every cut of Meat. If you like Merlot or Syrah how about a grape that tastes like a combination of Both called Carmenere from Chile??? People think of Ports when they think of Dessert Wines. I like Ports with Chocolate or strong cheeses like Stilton. I don’t like Ports with Passion Fruit Mousse, Creme Brulee, Creme De Papaya. So many people buy expensive Ports because once again, it is the Familiar. I like Late Harvest Wines. In Spanish TARDIO. It makes sense if you harvest the grapes late they have more concentrated sugars and produce those sweet wines. Torrontes is a grape mostly only grown in Argentina. I like it as a still wine but I LOVE it as a Late Harvest. Santa Julia part of the Zuccardi Family does an Organic Late Harvest Torrontes that is Candy and will make you want to lick the inside of the glass. Peaches, Vanilla, Melon, Apricots will be the perfect pairing with desserts or just by itself as Dessert and only $10 for a glass. I wanted to finish up this entry with a recent situation that just happened where I work. It is no secret how much I love Washington State Wines for their Quality To Price Ratio and their style of Winemaking. I recently added to our Wine List Amavi Cellars part of the Pepper Bridge Family of Wines from Walla Walla. Their 2010 Cabernet Sauvignon is a work of art produced by Swiss Winemaker Jean Francois Pellet. It is on our list for $59.00 per bottle and is a 91 point scoring wine and is loaded with dark fruits, blackberries, black cherry, layers of chocolate, herbs, minerals. $100 less money than any California offering and double the quality in my opinion. It is perfect for a guest who loves a big, rich Cabernet but doesn’t have a big Rich Bank Account. A husband took his wife to the Restaurant on a Saturday night and they didn’t speak very good English but they just kept looking for the names they knew from Argentina for a Cabernet Sauvignon. I made my recommendation for Amavi and the thought of Washington State gave them that Deer In The Headlights Look Of FEAR I discussed at the beginning of this Blog. Marilyn (The Birthday Girl) was scared to death so I CALMED her down and said “I am only here to help you have the best birthday experience of your life. I will leave you with the I Pad and you can take my suggestion or choose something that you prefer or recognize.” Marilyn was one of the few which I hope will increase gradually who waved me over and said…”Larry, you are the expert. 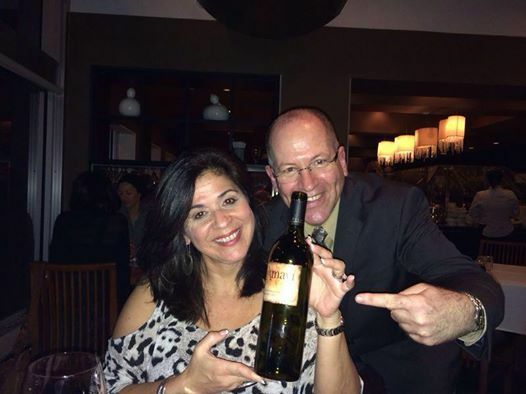 We trust your recommendation for the Amavi Cabernet from Washington State” I told her she would not regret it and I decanted the Wine for them. At first they didn’t look too happy but I told them to give the wine 15 minutes to aerate and try it again. When I returned they were ELATED. Marilyn had her husband take pictures of her holding the wine. She wants to order some on the internet and introduce her friends to her NEW DISCOVERY (Introduced by the SOMM of course)and she said “Larry, we have been to Napa Valley many times. I have drank many bottles of triple this price Cabernet Sauvignon and NEVER have I tasted anything as good as this and after 20 minutes in the decanter, this wine literally made my birthday the best one ever”! Thank you so much for all your help tonight!!!! My dining experience was honestly complete because of your suggestions. I absolutely would have never thought of sweet wine with dessert but it truely complemented my passion fruit mousse!!!!! I look forward to reading your blogs and learning about amazing wines. That’s all a Sommelier could ever want and why we do what we do Ana and Charles is to create memorable experiences pairing food with wines for our guests. Yipes, the Bodegas Caro Amancaya is available in Florida for under $15 Retail…and you are recommending it at $54.00 and also sugessting that it is like a Lafite??? That is a ridiculous but typical Restaurant Markup. I got started in the Wine business in 1973 working in the fields planting new vineyards in Santa Barbara County and ultimately spent over 20 years building relationships with Distributors, retailers, restaurants and Hotels; building Brands. But except very rarely, I coundn’t break this dirty little habit of ripping off customers with ridiculous markups like this one. Oh, well! If that bottle is selling for $15 Retail, here’s how the bottle got marked up. Winery sold it to the distributor for $8.25 Distibutor marked it up and sold it to the Retailer for $11.13 and the Retailer sold it for $15 ( -10% if you buy a case). This Restaurant sold it for more than 3x Retail…”at only $54″. Larry, that is OUCH in capital letters. Shame on you! You totally did not read this blog entry correctly. Where did I say that this was a Chateau Lafite??? I said and I quote ” that it is a collaborative effort between Phillipe Rothschild (Lafite) and Nicolas Catena in Argentina. “and at only $54.00 you can say you drank Lafite.”…I guess you meant that tongue in cheek, or more of your wine hyperbole. I checked on wine searcher and quite a few Florida retailers are under $16 a bottle. But more importantly, I miss your math for your restaurant’s markup…you pay 16.75 mark it up to $54… let’s see 3x $16.75 = less than $54 by almost 10%…so your winelist price is even higher than your proposed “industry standard 3 times! It is the most frustrating experience a knowledgeable wine person can have is to come to a restaurant for fine dining and see a good wine at a ridiculously high price; such as this example. I find that the real challenge with a good wine list is to find the gem that the Wine Director has made available. Because too many restaurants and too many SOMM’s have the mistaken concept that they are adding BIG, BIG BIG value added effect to the purchase of a wine bottle on Premise. Really people, it seems like you like Larry the Wine Guy but should you pay him like $54 to open a wine for you that you can get at Total Wine for $15.99 Really? Fair markup 30% not 300% Your call customers. Plus remember customers, your tipping based on the total bill, so more $$ leaving your pocket. 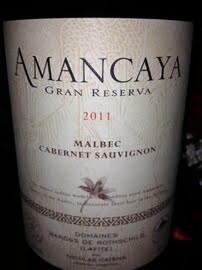 The best price I could find on an INTERNET Site which doesn’t include the Shipping And Handling is $19.99 For Amancaya. Secondly ALL and I mean even the best 5 star restaurants barely mark up 2 times on the higher end items so the AVERAGE Markup in Restaurants is 2.5-3 Times up. However they you need to markup your lower cost wines come 4-5 Times Wholesale from the Distributor and every Distributor can charge whatever they want in different states (as they need to make their profit in the 3 tier system as well). We have wines we buy for $5.00 and markup 6 Times but many Boutique Expensive Wines we barely mark up 2 times so once again AVERAGE Markup should be 2.5 to 3 times but every wine list in the world has at least 40% wines marked up 5-6 times because the guest always will pay Under $60 if a wine is QUALITY in a Restaurant. You and all Restaurant guests are always welcome to buy the wine for $19.99 …bring it to the restaurant and pay a $30 Corkage Fee and save yourself $4.00 and cause yourself a headache driving to a retailer to buy the wine instead of just going out and DINE OUT… People with your philosophy should stay home and not dine in Restaurants.